Those Places Thursday - Can You Guess Where I Am? My 6th cousin 3x removed. 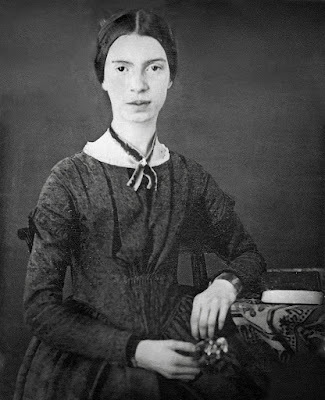 Emily Dickinson and I share a grandfather (way back there). His name was Henry Brooks (1592-1683). Let's look at how I fit in with old Henry. 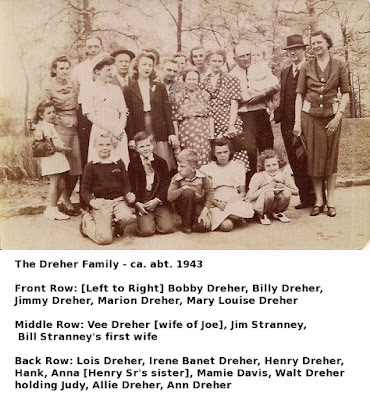 I have been asked how there can possibly be so many well known people in our family tree, and I will explain that once again. Many of my paternal lines can be traced back to the very first English settlement in Jamestown, Virginia. If someone can trace their American ancestors back to that small group, or say to the time of the Mayflower even, there were a minimal choice of spouses for them to choose from. Which means that 10-15 generations ago, if a "famous" person can also trace their ancestry to that small beginning, then there is a higher chance of your being related somewhere in that tree than that of someone who immigrated say in the 1850's. As a country, America grew in leaps and bounds. But it started with a couple of very small groups who dared to cross the ocean and settle upon its shores. It would be much more difficult if all of my ancestors came from Ireland or England or Scotland, to find that I was related in some small way, to someone of fame. But they didn't. My paternal ancestry is quite varied, as DNA tests have proven. I can trace those little branches all the way back to before the Plantagenet's. But to go past my great-great-grandfather Bean, well, we may never solve that little mystery! Still I plug on, and hope one day I will be matched with someone who can shed some light upon him. So for now, it is fun to find the little branches, and wait for that big one! ****UPDATE: Did you get where the Those Thursday Places was from? No? 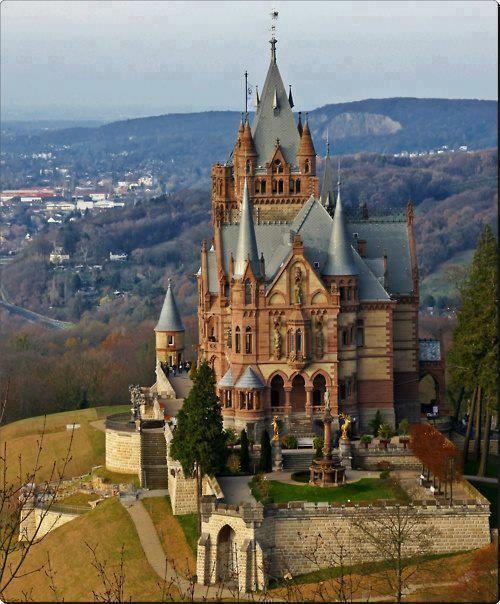 It's Schloss Drachenburg in Germany. Or Dragon's Castle. It's a beautiful place! Sorry, I can't take credit for this photograph. It is taken from an old postcard I have. 2nd Hint: It's named after a mythical creature! When it comes to weddings, I've had a few too many. Having finally met my true life partner, and marrying him 19 years ago! And it's been a glorious marriage! I wouldn't trade a moment I've had with him! Since I missed putting my anniversary up here at the time, I thought it appropriate to take time today to tell my dearie, how much he is loved and appreciated. He stepped in as a Dad to a household of five teenagers. A women who still wasn't sure how she fit into this world. And he accepted and loved us all, as if we had always been together. His family, his mother, and his siblings, have all so graciously accepted me into their family and lives, that it seems quite natural to be together with them. And mine just think the sun rise and sets on this man of mine! Sometimes we have to walk through the fire to find what we should have found much earlier. But once we do, we realize that the path we walked still lead us right to where we belong. I was so blessed to have my Grandma Bean in my young life. She came to live with us when I was only 5. And she was with us still until her death on January 1, 1975. Grandma enjoyed talking about her childhood and her family. She was so proud of my Dad for bringing her to live with us. She had early onset Alzheimer's. (They just called it 'hardening of the arteries' back then.) So I saw her go from a vibrant, hard working woman into a shell. But I still remember doing things with her when she first came to live with us. And Grandma taught me about my Daddy as a little boy. She told me about one time when the family was getting ready for church, and she had him all clean and handsome in a little sailor suit for church. She turned and he was gone. Probably about 4 or 5 years of age. She and my Grandpa found him. He had gone wading in the stock pond! Grandma said she had to throw his clothes away because she couldn't get the mud out of them. I would giggle when she said she spanked his little behind. So funny when you're only five yourself! And then she would get teary eyed, and tell me about an uncle I would never know. He was younger than the rest of Grandpa's children. He was the baby of the family. (Grandpa had outlived two wives when he married my Grandma. Between the three wives, he had 15 children. He saw four die before him.) Grandma was the mother of the youngest three children, and thus she bore the youngest child of all. His name was Roy Edwin Bean. And I try very hard to keep his little memory alive. You see, he died when he was only 3 years of age. Grandma always called him by both his first and middle name, Roy Edwin, when she spoke of him. He was a fair-haired child. And Grandma's third son. My Dad was Grandma's eldest. So, Dad can still today recall events with little Roy Edwin. Grandma used to say he got into mischief. And at three, he still had "accidents". Then I didn't understand, but you Moms out there know exactly what I'm talking about. Those little accidents you fight against while potty training your child. Some learn in a single day. And for some it may take 2 or even 3 years! 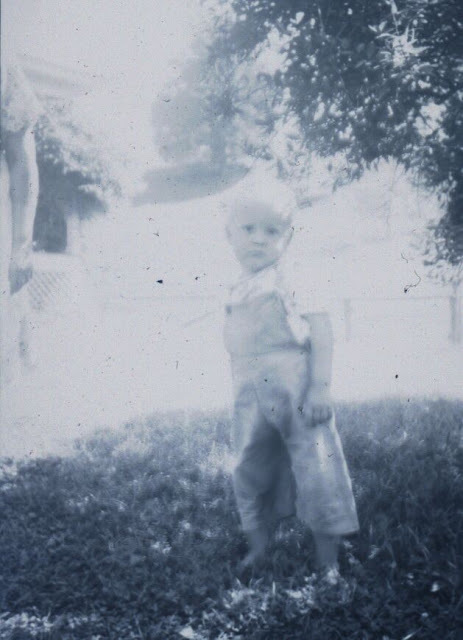 Little Roy Edwin Bean. he had had an accident here, and was wet. He looked so much like my Dad though! Wasn't he a cutie? He was so full of life! And his big brother doted on him so! Then one day, little Roy Edwin began to cry with a tummy ache. We've all had a child who did this, we give them a little something for it, if nothing but a baby aspirin, and they begin to feel better. But Roy Edwin didn't get to feeling better. Grandpa thought maybe the child was constipated, and they gave him some cod liver oil. Still he was no better. It was decided after a couple of days to take him to the doctor. From there he was rushed to the old hospital at Ronceverte, West Virginia. There he was diagnosed with a burst appendix. In 1946, there wasn't anything that could be done. They kept him as comfortable as they could for the time. Until he began to fade. The light was slowly extinguished from his little sparkling eyes. And one moment he was there, holding his Mommy and Daddy's hands. And the next he was with Jesus in Heaven. Grandma never did get to talk about him without getting choked up and crying. And who could blame her for that? What mother could? Little Roy Edwin was layed to rest in the Carmel Presbyterian Church cemetery, next to a brother and two sisters, who he never knew. 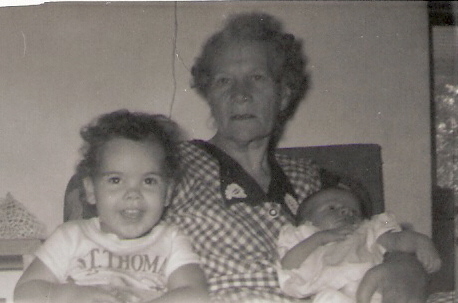 Beside him are Samuel Maxwell "Max", whom my Dad received his middle name from (1919-1923). Dorothy Eloise (1923-1925), and Pauline (1902-1925). Eloise and Max's mother is buried there as well, Ada L. Burdette Bean (1883-1929). Each year we decorate the graves of those young aunts and uncles of mine who didn't get to see how many would continue to love them dearly to this very day. I am sure the other three children were as deeply loved as little Roy Edwin was. But he will forever remain in a tender part of my heart that sheds a tear when I visit his site. That mourns for the man he might have become. The family he might have had. And the love we would surely have shared. Rest easy little Roy Edwin. Be in peace with your Mommy and Daddy. One day I will meet you, where never more shall we shed a tear. I know we all have them. Those rotten Monday's when you feel like the weekend took everything out of you, and now you have to force yourself back into the work week. And it'll start all over again in another week. And so on and so forth. So, what gets a body up and moving on Monday morning? How about working a job where you feel you've made some contribution and it's recognized! Yep. We've all worked for someone in our lives who could give a rat's.... oh sorry... could care less about us. They may tease us with their "You're the best worker I've ever had!" but will talk down about you behind your back. "You should see what a slob that woman is! Her desk is always a mess, and she never wears any trendy clothes. Just those baggy shirts and baggy pants! You'd think she shopped at the Goodwill!" Yeah, I've heard that one, and several others, before. Lucky for me, several years ago I was laid off from work due to my health. (Yes, it was lucky! Let me explain!) I was a nurse working in geriatrics. I was spending more time in the hospital than in my job place, and my husband and my doctor told me it was time for me to quit working. Well, I wasn't raised to just sit, which is what I had to do. I was on oxygen 24/7. Not a lot that left me able for. So I joined an MLM (I won't name it here, because you probably have all been invited to join it by a friend or family member). I loved sales. And I did very well with it. In about 6 months I had replaced my income as nurse. And then the big "A" came along. What is the big "A". No it's not some form of cancer. The big is "A" for me was when I got so sick, and had to see my doctor and they couldn't find anything wrong. Except when I told my doctor that I was selling products that contained a certain allergen free oil, and was tested. I was working for a product company that touted all of it's products were natural and non-allergenic. Except, guess what? The "A" was that I was "allergic" to the main ingredient! So I was back at square one. I didn't just want to work at home. I wanted to work at home doing something I truly enjoyed. And I started out using my sewing skills, and knitting and crocheting items for sale. I rarely made more than what it cost me to make an item. It seems that if an item is handmade, there is little room for hourly wage, since something similar can be purchased from a company who imports from a 3rd world country for pennies on the dollar. Then I remembered a writing task I had when I was in college. It was in my Sociology class, and explored our ancestry. I had done a little investigating then. But it was only what was required for the class, but I knew I liked it. I knew I would enjoy it. So I began to research how to do an ancestral search. And I began working on my own family tree. I was so blessed to be mentored by a very great lady who had done a lot of family research on my Dad's side of the family. She and her husband. And I'm talking long distance searches! Nothing stood in her way! And so, armed with a book she'd put together of our family, I began to add it to the free family genealogy software that was then offered on FamilySearch.org. And then I began to see comments from individuals whose names were repeated on many different sights I found through research. And it wasn't long before I belonged to several groups, and research studies. Yes, that genealogy bug bit, and it bit hard. A few years ago, after clientele began to drop off somewhat, I went back to work in geriatrics. This time loaded with a social workers degree on top of my nursing license. And I am doing a job that I absolutely love! It allows me to go into the homes of the elderly, and work with them as a care manager, to prevent hospitalizations, trips to the E.R., or even nursing home placement. I am the one who organizes their care and plans for their health. I teach, I supervise, I advise, and I love. Whatever they need doing, I find a way to get it done. Once I even sponsored a "Go Fund Me" page for a couple who had no income, but had an electric bill that was astronomical. They were without power for almost 3 months. But we got the bill paid, and gave them a little extra to keep going until we could get them some public assistance. And yes, I miss the fun times I had while performing genealogy research. I loved seeing the nonsensical come to life! Finding the missing puzzle pieces! But I love the job I work now as well. I use many of those same research principles to find out things I need to know in this job. The really great thing is, that whether I am home for a day and working genealogy for myself or a client, or I go out on the road and am doing research to help a senior citizen stay healthy, I am happy. Even when Monday's roll around. And for that, I give God the credit. He has placed me in a time and place where I get the best of both jobs that I truly enjoy. So, Thank God for Monday's! It seems we all have them. Those little clippings from the newspaper where some family member was finally made known to the public. In the OBITUARY columns. Sad, isn't it, that we seldom see what the person really did with their life while living. We are relegated to this all too brief form of mention. Most never listing more than the parents and survivors of his/her family. I personally would like to people lauded for their efforts in this life, while they were yet breathing! Let them know how much they really mean to their little corner of the world! I once read a newspaper from a small town that had a weekly column that did just that. They would pick some seemingly insignificant person, and tell their life story, while still living! I like that much better than the obituary column mentions! 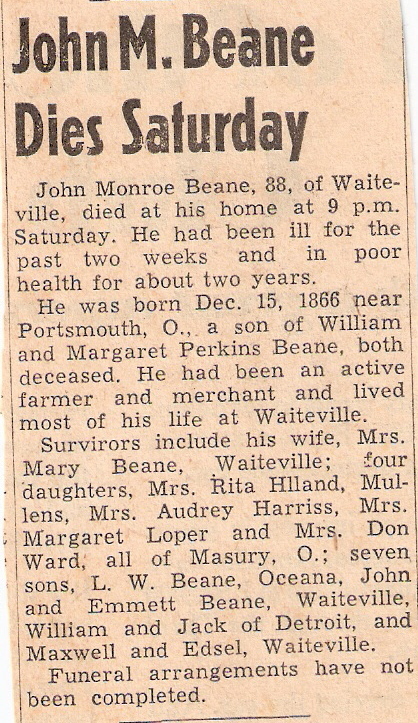 However, these two obituary's are about a man who died five years before I was even born. A man who had his own story to tell. A man who outlived two of his three wives. Who saw some of his children die, and buried them in great sorrow. A man who knew both success and failure. A man who was loved and adored by his family. My paternal Grandfather. John Monroe Bean. The following is uncertain from where it came. 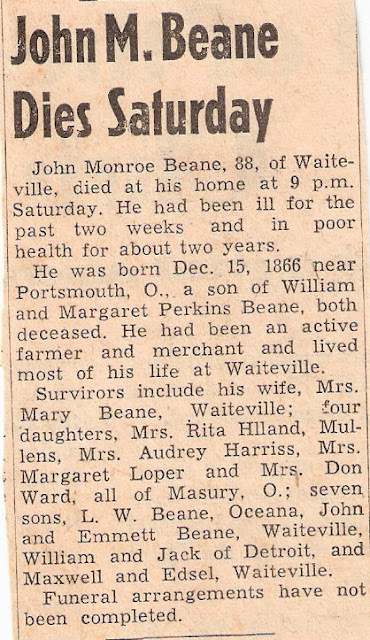 Probably the Monroe Watchman, the local paper. The past few months have been wrought with celebrity deaths, proving that only two things in life are guaranteed: Taxes and Death. One of the ones that really caught my eye, along with that of the infamous Chuck Berry, was another Chuck. Chuck Barris. How many remember watching The Gong Show"? It was a great little 30-minute primetime television .Wikipedia has this to say about it: "It was broadcast on NBC's daytime schedule from June 14, 1976, through July 21, 1978, and in first-run syndication from 1976 to 1980 and 1988 to 1989. 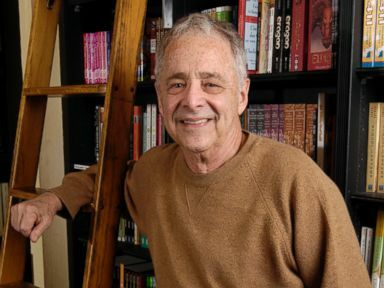 The show was produced by Chuck Barris, who also served as host for the NBC run and from 1977 to 1980 in syndication. The show is best remembered for its absurdist humor and style, often awarding participants ridiculous and worthless prizes." I absolutely loved the show! You got a bellyful of laughs. But some great acts were cast from that show's participants as well. Who can forget Chuck Barris as he sometimes comedically took the stage to host the show? And he did so that everyone, guests and participants had the best time ever! Those watching from home had to keep coming back the next week, just to see who, and what, was going to be on! How many of you know that Barris produced the show? Or that when the Gong Show first arrived on the scene, Barris was already an old hand at creating and producing game shows? I'm sure you will remember The Dating Game, and The Newlywed Game. He also wrote music. His biggest hit being Pallisades Park" in 1962. Did you know that the hit film, directed by George Clooney, A Dangerous Mind, was based on Barris' autobiography of the same name? He claimed to have been a CIA assassin from the 60's to the 70's. He wrote a sequel to that book, Bad Grass Never Dies, in 2004. However, it never reached the acclaim of the first book. Barris will not be forgotten. He passed away this past Tuesday, March 21, 2017, at his home in Pallisades, California from natural causes. He was 87 years old. 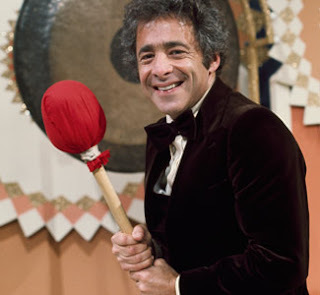 While no relation, Chuck Barris was an icon from my late teens until my mid-twenties. And I highly admired his work, which has barely been touched here. The elder William first appears in documents in 1804 at the age of 12 when he is placed in servitude as an indentured servant to one Mr. Ballard. A careful review of this document tells us nothing of why William was placed in indenturement. The event occurred on none other than his 12th birthday to be precise, September 18, 1804. In February of the same year, a brother, John, was also placed as an indentured servant. What happened to these young boys (John was 14 at the time of his placement) to put them in such a predicament? DNA tests can tell us that he probably came from England or Ireland. But the trail literally is cold from that point. There was a William McBean in the area just 10 years prior. This may have been senior William's father. And a Sarah Bean in the 1805 tax rolls that "owed nothing atoll, owning only her clothing and a spinning wheel". These are presumed to be the parents. But there is no definitive proof. DNA has not been matched to any other Bean lines. Including Beane, Bane, McBean, MacBean, Bein, Been, and well, you get the general idea. It is as if our family literally dropped out of the sky! We hope to one day find the missing puzzle piece. At least that is my goal. Here's to hoping it won't be too much longer! Those of us with a real interest, well, we're not getting any younger! "Gayle was born on March 12, 1934 and passed away on Friday, March 10, 2017. 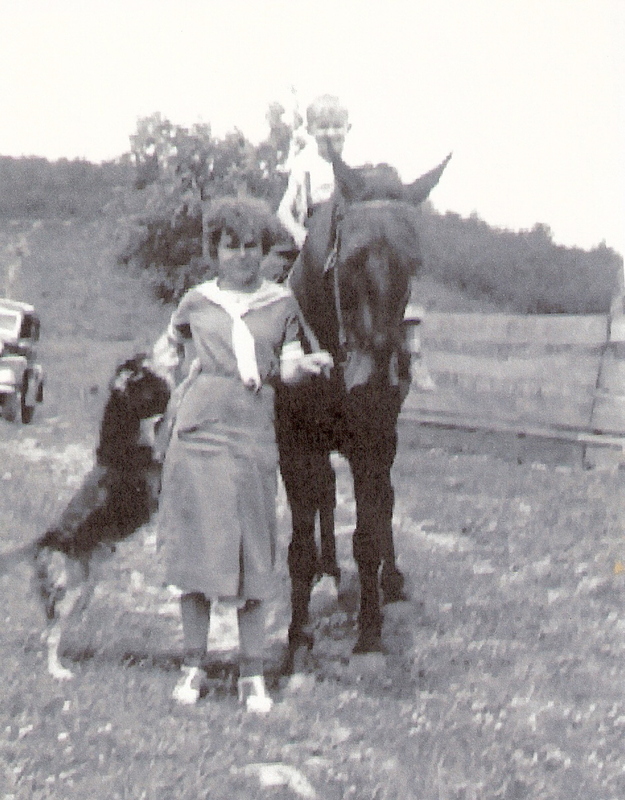 Gayle was a resident of Ripley, West Virginia at the time of her passing. Gayle was a 1952 graduate of Oceana High School. She was married to Almon M. Hall. The funeral service will be held on Tuesday, March 14, 2017, at 2:00 pm at the First United Methodist Church in Ravenswood with Reverend Ken Peters officiating, Burial will follow in Ravenswood Cemetery. Friends may visit the family also at the church on Monday, March 13, from 6:00 to 9:00 pm. In lieu of flowers the family has requested donations to the American Heart Association, American Cancer Association or First United Methodist Church." Gayle was my cousin. Her paternal grandfather, was also my paternal grandfather. Due to our age difference I didn't spend very much time with Gayle, although we got together at family reunions and talked about the grandfather I never got to know, but she did. She had some precious memories of him. Gayle will be deeply missed. Probably about 1935 +- a year or two at most. 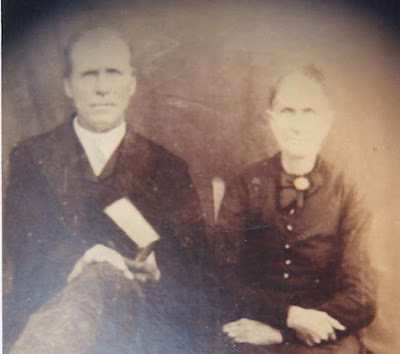 Eleanor and Jack were the children of John Monroe Bean and his second wife Ada L. Burdette Bean. Just leave me alone! 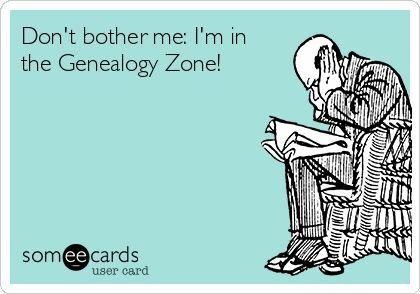 I'm in my genealogy space! ****Did you figure out where I was yesterday? 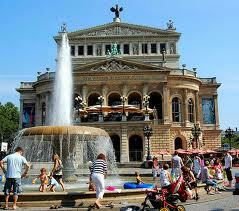 Did you guess the Frankfurt Opera House, Frankfurt, Germany? Can you tell me where this is? I once visited here, while living in this country. If you know where this is, please post it in the comments. This is a photo of my hard working Grandmother, Irene Banet Dreher back in the 1940's. 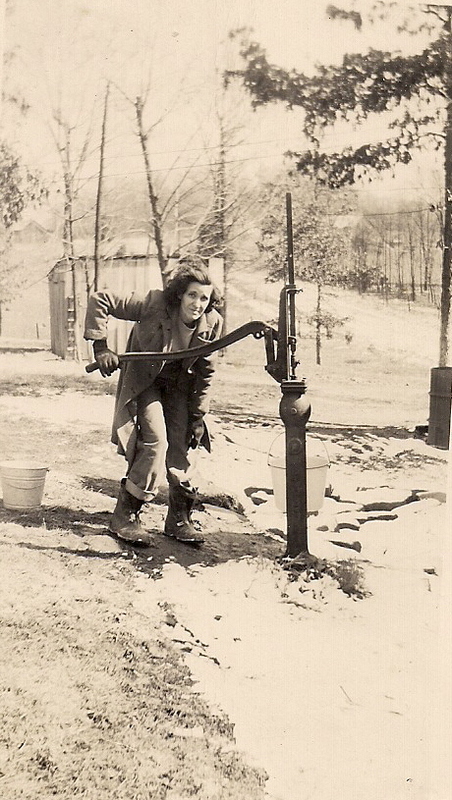 Here she is during the middle of the winter pumping water to be used in the house from the well. Each year our family places flowers on the graves of our loved ones in the local cemeteries on Memorial Weekend. the photo above is the tombstone of my great-grandfather, William M. Bean, who I wrote about yesterday. This is his grandson, Walter Beane. Walter is my Dad. The stone is ornate, and reminds me of a newel post. On one side is the inscription for William, and the other is the inscription for Margaret. Farther down the hill and to the left lies William's son John Monroe Bean. Closer to the front of the tombstone and slightly to the right is his daughter Alice (ally) and her family. Other family member's are scattered throughout the cemetery. They include children, grandchildren, and even great-grandchildren. This is the New Zion Union Church Cemetery at Waiteville, Monroe County, West Virginia. Many years ago, before they were ever published on the Internet, I ordered a copy of William M. Bean's Civil War military records. What looked very straightforward, was in fact something that became the mystery of the century. After I received copies of all of his Confederate war records, I began searching for Union war records, as his granddaughter declared that her Pa told her that William had switched sides during the war and went to the Union side. My first encounter was from an email I received from a hired researcher who had gone to retrieve the materials I requested, in person. However, she emailed me back that evening, and stated the records were sealed. I was in a bit of a shock when told that I wouldn't be receiving records on my great-grandfather. I argued that there was a legal right to see military records that were that old, and as his great-granddaughter I should have access to those records. The researcher apologized to me, and asked that I contact the National Archives myself. About 4 months later, I received a manila envelope from the National Archives. I was beside myself with anticipation in finally getting the records! But when I opened the envelope, I found my copy of the order I had sent, along with a letter of explanation. A Covert Operative? This was all very perplexing. And the puzzle pieces were too many to make any sense at this point. From the Confederate records, we knew that William was taken prisoner on 13 July 1864 in Hagerstown, Maryland. He was sent to Elmira, New York as a POW (Prisoner of War) on 28 July 1864. And that was where the Confederate records left off. Something happened between 28 July and 02 September. And I don't believe great-grandpa "switched sides". Let me continue and you'll see where this leads. In October of 1864, a Union soldier was transferred from Elmira Prison to Johnston's Island, Ohio. We all know about the terrible conditions at Elmira POW prison. But few know the story of Johnston's Island. This was a Confederate POW camp, that catered to only Confederate officers. The men were housed in barracks that had warm winter stoves. They were clothed warm and comfortably. Often receiving gifts of sweets, or blankets, or mittens and scarves, from the local church ladies, or defenders of the Union cause. Their was much laughing and game playing. In October, when a new Union soldier arrived, he was not given a regular guard post. But was instead required to report to the Commander of the Post. Here he divulged a secret that he had been told while he was held in the Elmira prison. When in reality, he was not a prisoner of war, but was working under cover for the Union Army. The secret he told the Post Commander was that the Confederate Army was planning a raid on the Island prison. They were going to send tugboats and a flatboat down the river to Johnston's island and free the POW's in a surprise attack. This soldier laid out a plan, which was received by the Post Commander, to meet the boats upriver, under cover of darkness, and blow them to bits with cannon fire. And that is what happened. The boats were loaded down with gun powder which they were going to use to break into the prison. In the report, the Union soldier who gave this information was not named, due to his under cover work. However, the only soldier who arrived in the Johnston's Island post from Elmira at the time of the report was one William Bean from Monroe County, [West] Virginia. So, now things are beginning to come together! The puzzle pieces were begin to slip one into the other. But the big question was why wasn't the military records opened due to the Freedom of Information Act? We were talking some 150 years after the fact! Not something that just happened yesterday! Several of us got together and began trying to work through this information. The most interesting was that the records were sealed under Presidential Order on 10 April 1865. Just one day AFTER Robert E. Lee's surrender at Appomattox, Virginia. And just 4 days prior to President Lincoln's assassination. What was so important that even 150 years later, the records remained sealed? A good guess would be that there was something in his records that would change how America looked at the Civil War. William's son, John, knew what it was. But a team of horses could never pull it from his lips. He would die with the secret held tight. In 1890, William, who was a U.S. Marshall, was shot in the back of the head by a Constable and died. When the Justice Department tried to get his widow to pursue her rights to also bring the killer to trial, and not just the county's right to, she declined. She stated "I still have to live in the county with these people. My children and grandchildren still have to live here. I won't put my family in danger!" Why would she use those terms? 'I won't put my family in danger!' What was she afraid of? William, according to all records, became a Union soldier after "defecting" from the Confederacy on one record, and being taken "prisoner of war" on another record. What makes this so unusual is that William never took the oath for the Union Army. There is no record of this. Neither did he do so after the War. He held some political clout within his county. Odd for a "Union sympathizer", as the county was die-hard Confederates. He also became a U.S. Marshall, and never took the oath of office. The Justice Department declined to comment after I requested a copy of his records of having served as a U.S. Marshall, and was told they had no such records. Yet his obituary states he was a U.S. Marshall, as does his death certificate. A few years ago, I spoke with a very lovely lady at the National Archives, who assured me there was no reason on earth that I could not get copies of William's Union military records, because of the Freedom of Information Act, and she would be the lady to go get those. Yes, great-grandma crossed the battle lines, in a covered wagon with four young children, and two of her brothers as escorts, to join William in Ohio. But the records have vanished of great-grandpa's service. Oddly enough, the records vanished AFTER I had made inquiry of them. There are no records in the Justice Department of him having been a U.S. Marshall. I could put that down to family folklore, except two different documents state he WAS a U.S. Marshall. Well, we said it sounded like a James Bond novel, quite jokingly. But then, suddenly we weren't laughing. And we weren't kidding. The clues had been in the letter I had received from the National Archives. In bold letters, COVERT OPERATIVE. William had been a double agent. It was the only thing that made sense! He never took the Oath of Allegiance after the War. Yet every man who had served in the Confederate Army had to take it in order to vote, to buy property, or to have business dealings. William didn't take an oath. Why? Because he was already working in the Union Army. Under cover. He was sent to spy and report to the Union officials regarding bridges, and planned raids and attacks. The bridge at Caldwell crossing the Greenbrier River was occupied by the Confederate Army. It was captured for a short time during the War. William was stationed there as a Confederate soldier. Yet, when the bridge was captured by the northern army, William was home on a leave from duty. William was "captured" in Hagarstown, Maryland according to Confederate records. But within days he was no longer a POW, but a traitor who had "switched sides". These documents are dated after the raid at Hagarstown, but before William had ever arrived at Elmira, where a POW list was first written of his arrival and sent to the enemy. How did the Confederate Army know he was Union, if it hadn't even happened yet? Why did his name suddenly disappear from the Johnston Island records? The National Archives? And the Justice Department? And only after hard inquiries had been made about him? I personally searched the National Archives for William's Union war records. And there is no trace of them. His military records do not reflect anything but the Confederate records. And the last two are contradictory, as the one lists him as a POW, and the other as a defector who enlisted in the Union army. What could possibly be so important that records were sealed one day, and had vanished the next? We will probably never know. But whatever it was, it was important enough that 150 years after the fact, someone made the records disappear. Forever? Who knows. I doubt I will ever know, until that day I meet my Maker, and am able to look great-grandpa in the face and ask "Can you finally tell me what happened? Cause I'm dying to know?" (no pun intended). I would get to sleep in the front parlor, in Grandma's bed with her. There was a big old warm morning stove in there, so in the winter time we stayed toasty warm. Eydie slept upstairs in an attic bedroom with Mom and Dad, and there wasn't any heat up there! Brrr! When I was about 2, not long after Eydie was born, my cousin, Johnny, and I were playing in the front parlor. And as things happen with little ones, I ended up catching myself on the hot woodstove. My right palm literally burnt to the stove. (They tell me that my Dad had to scrape my palm off the stove with a pocket knife afterward.) I ripped my hand away, and the pain was unbearable! I can remember it hurt so bad that I peed my pants. Now, mind you, I was only about 24 months old, but I was most upset about my peeing my pants than the burn! I cried over that. I remember the pain being so bad, and crying out loudly, 'Mommy, Daddy help me! Anybody help me!' over and over again. )Then I can remember Mommy holding me in the car, while Daddy drove us to Union, to Dr. Guy's. He took us right in. I can still see the place in my memories, and even smell the alcohol antiseptic smell. I remember how fluffy Grandma's bed was. It had a feather tick mattress on it. Daddy would pick me up and toss me into the softness. He'd kiss me goodnight and tell me to scootch all the way over to the far side of the bed (against the wall) so that Grandma would have room to get in when she came to bed. I remember the living room suite that Grandpa had bought Grandma when they were married. It sat in that front parlor. It was a heavy, dark mahogany color, with chocolate brown horse hair cushions. They weren't soft, but scratchy! Years later Mommy took the set and refinished them, and made all new cushions for them. After I had children, she gave me the set, and I was young and stupid and gave it away. How I wish I still had it! Grandma would come and snuggle up to me when she came to bed after I did. She would tell me stories, and we would giggle until one or the other of us fell asleep. She was always the first up. She had a very tiny kitchen by today's standards, but for the time period when the house was built, about 1800, it was large enough. There was room for a wood cook stove, and a small refrigerator, and a work table, and a small standing cabinet. Grandma could make the best biscuits and gravy! And there was nothing that made me happier than when she taught me to bake homemade baked custard! Oh, it was so good! Grandma didn't have running water. Instead, there was a galvanized pail, and we would walk to the little mountain spring that ran near the house, and where the water bubbled up, we would dip the bucket into the pool of water and carry it back to the house. A metal ladle hung on the side of the bucket once in the house. When you wanted a drink, you simply took the ladle and dipped the water from the bucket and drank from the ladle. The water was always ice cold when it was fresh from the spring. And I remember it had a slight iron taste to it. Not bad, but mineral rich. It was so good! In the dining room wall, just above the bed, were three drawers built into the wall. About 24-inches wide, and about 12-inches deep. Perfect for table linens and such. My sister is at this moment having her kitchen remodeled. And she is putting those three drawers into her kitchen wall. I almost cried when she told me that. I didn't even know that they still existed! A small legacy added to her kitchen! When I was five, my Grandma Bean came to live with us. She wasn't particularly elderly. Well, not by my standards today! Born in 1898, she was 66 when she moved in. We were thrilled to have her! In the spring, she and I would go out into the lawn and pick dandelion greens. I would still do it today, but I have a dog. So, believe me it's not an option! But today, I always manage to get spring mixed greens that have dandelion in it. For years I made dandelion wine. It was more of a fermented fruit punch, and had to be watered down due to the sweetness. But once it was fermented, it could pack a punch! But that was made with the flowers, and not the leaves. I can remember Grandma always wearing white canvas sneakers. And they were always spotless. ALWAYS! I learned that she took baby powder and sprinkled it onto the canvas shoes and would rub it in with her powder puff. She always smelled so good! She wore White Shoulders perfume. I can't smell it now without thinking of her. She rolled her hair by simply making little rolled up curls around her finger, and then using bobby pins she would pin the curls to her head. Her hair was very fine and thin. She had the best jewelry ever! Large beaded necklaces, and clip on earrings. Brooches that were so pretty! And when she passed, I received her wedding band. I wore it until 2005, when my niece was getting married, and I passed it on to her. Now she has a daughter who will one day get her great-great-grandmother's wedding band! Grandma had once taught a little girl who didn't speak. So she had learned sign language. She tried to teach me, but I was impatient and wouldn't sit still long enough to learn it. Of course, now I wish I had! Grandma loved to sing with others. One of my favorite memories are of her, and my Grandma and Grandpa Dreher all sitting in the den in our house in Virginia, singing hymns together. I was simply enthralled! Grandpa had a baritone voice, and my two Grandma's were these sweet soprano voices. It was like Heaven opened up for me and I was listening to angels sing! Daddy audio taped it. But eventually the tape disintegrated. I would have loved to have a copy today! Grandma began to go down pretty fast when we moved back to West Virginia. She was so excited to get here. And when she saw her beloved Peter's Mountain, she knew she was home. We lived half-way between where she grew up, and where she lived with her own family. Mommy and Daddy couldn't have picked a better place. Then Grandma began to get sick. Her mind began to slip. I was 14 when it started. She would sit for hours on end, and not say a word. The doctors told us she had "hardening of the arteries". They didn't have medication then to combat this. Today, when plaque begins to build in the arteries, your doctor will put you on statins to lower your cholesterol, and usually a lower dose aspirin, if not a blood thinner. But the technology just wasn't there. Bless my Mommy. When Grandma got down and in the bed, Mommy did everything for her. She couldn't have shown more love if it had been one of her children, rather than her mother-in-law. One day, Grandma was more lucid than others. She asked to have help to get up. Mommy got her dressed and brought her out into the dining room, where she sat and talked so coherently! She asked Mommy if she would "shingle" her hair. Mommy cut her hair into the many layers she wanted. And while Mommy was cutting her hair, Grandma told of us of a time when she asked my Grandpa to cut her hair. (There was a good difference in their ages, and Grandma always called him 'Mr. Bean' or 'Daddy'.) She said that Grandpa had been clipping away at her hair, at a rather fast pace, when suddenly the scissors dipped and he clipped off the very top of her ear. Well, of course we thought she didn't know what she was saying. But we looked, and sure enough, just the very tip of her right ear had been gone! But she laughed about that. Telling us how worried he was that he had really harmed her. Because she was so alert that day, Mommy asked her what she would like to eat. Mommy told her to pick anything in the world that she wanted. Grandma said simply "I'd like some popcorn." So, of course, the popcorn popper came out (remember the old electric kettle that you put oil into and popped corn?). Mommy popped a huge large bowl of popcorn. And Grandma ate and ate! 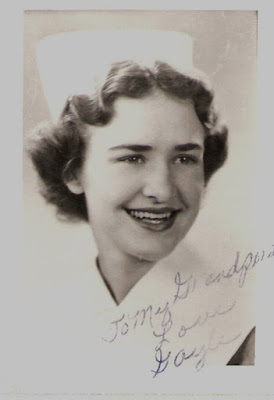 Mommy then asked her if she'd like to call her sister, Aunt Veda, who was the only sibling left of the family at the time. And Grandma got to talk to her sister for the last time. It was October. That night Grandma went to bed early, as she always did. And we talked about what a wonderful day it had been! When the next morning came around, Grandma didn't know any of us, except for my sister, Eydie. She was bedfast again. And she gradually grew worse, until in December she was hospitalized twice. On the last time, it was the day after Christmas that she had to be put back in the hospital. We all gathered around her bed. And on December 31st, Mommy asked her if she knew any of us. She knew us all by name, except for my uncle. But she especially knew my sister, who she called her 'baby doll'. Late that night we left her to go home for a few hours. Not even remembering it was New Year's Eve. And within the first hour of the New Year, the telephone rang. It was the hospital telling us that Grandma had passed peacefully. I think we all regretted we hadn't stayed with her, instead of coming home. On the 3rd of January 1975, it was bitter cold. The ground couldn't be dug, and they used dynamite to blast a hole open to get to soft enough earth to dig her grave. It was hard the first few years when New Year's Day rolled around. Grandma was the first thing I associated with New Year's Day. But many years have passed. I still remember her on New Year's Day, of course, but the memories I have of her throughout the rest of the year are such happy ones, that the sadness is gone. I've tried to instill in my children the sweet, sweet spirit that my Grandma had. She never spoke badly of a single person. At least not where I ever heard! And others have told me the same thing. She fiercely loved her family. And she loved God. I hope that others can say the same of me one day, for that is a spirit to aspire for. Just two little sisters, in front of the camera again. 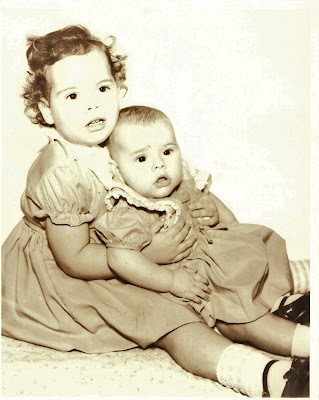 That's me, with my little sister, Eydie, way back when she was only a year old. Wasn't she a cutie? And look at the natural curls I had then! She's still my very bestest friend ever! Probably one of the most patient men I have ever known. He was so very dear to me, especially as I got older. 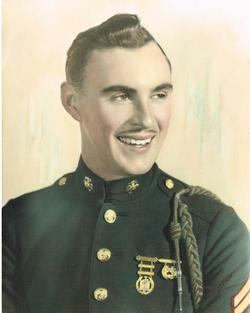 Served in the U.S. Marine Corps from 1935-1940. A hero. Storyteller. Family secret keeper. And my uncle. Man, do I miss him! ****Did you guess where I was at in yesterday's post? Hamburg, Germany at Lake Alster. 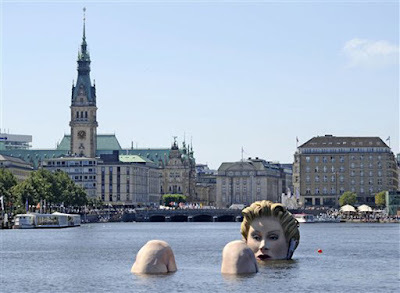 The Bathing Lady is well known in Germany, and she is featured on many postcards. This is a place I once visited. Can you guess where it is? This is a sculpture of "The Bathing Lady" in the middle of a lake. ****Did you guess yesterday's photo of my 5th Cousin 4X removed? 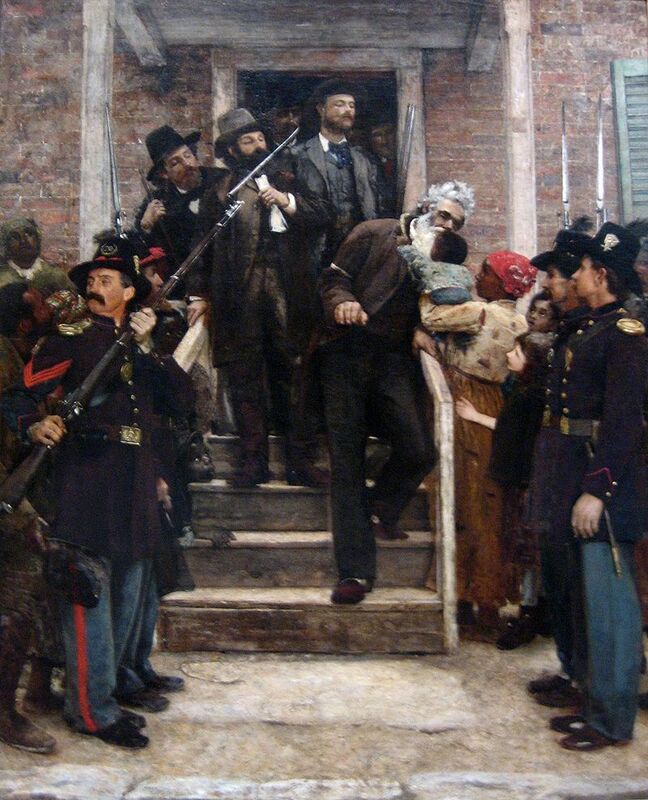 The answer is none other than the abolitionist, John Brown, who was hanged at Charles Town, (West) Virginia on December 2, 1859. He led the massacre at Pottawatomie, and the raid on Harper's Ferry. He was the father of 20 children, 11 of whom lived to become adults. Our common ancestor is William BATEMAN (1590-1658). Can you guess who my 5th Cousin 4X removed is? You didn't come by those copies of census records, birth certificates, death certificates, marriage records, or photographs easily. And yes, they are all saved onto your computer. So, what do you do with all of those paper records? Me, being the person that I am, intend to leave me genealogy records, which are quite extensive, and I've spent almost 20 years on, to the Historical Society of my family's county upon my death. Since I am not sure what form of digital record may then be most popular, how do you prepare for this? I have kept every scrap of research I have on paper. And everything has been organized and is in almost a dozen 5-inch three ring binders. But the papers themselves, how do we protect those items? We've all seen the musty newspapers at the library, that are brittle and must be handled with white gloves to protect them from oils on our hands. We've seen documents and books the same way. See, as paper ages, it becomes brittle. And oils from our hands can make a real mess of it all. The solution is simple. Place each document in an archival sleeve protector. I use the Avery brand shown above. Make certain that the package states that the sleeves are archival quality. And I must tell you, they aren't real cheap when it comes to purchasing all you need. A couple of years ago, I was lucky enough to purchase some in bulk on eBay for a rather reasonable amount. 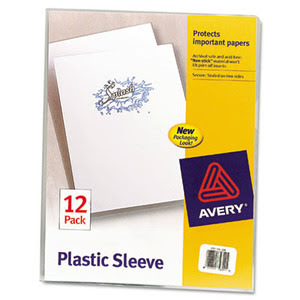 The Avery brand above usually retails from $3-$5 for 12 sheets. Now you can see where the cost begins to come in. Always print your document on acid free paper if you are printing from a file. And never, ever, put pages in back to back, as ink can sometimes leech onto the next sheet. So, one sheet per protector. Doing these things will keep your documents legible for a very, very long time. But what do you do with the archival sheets after you've filled them? 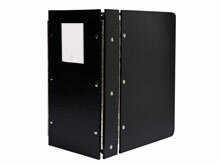 You will want to put your archival sheet protectors in an archival quality three ring binder. Notice how the spine is hinged? This will protect your binder from coming apart as others do after a time. Should a paper accidentally come into contact with the binder, it is archival quality, meaning acid-free, so no worries. While most of the archival notebooks I have use a front, or back label for identifying contents, I use an archival quality label to place on the spine of the notebook. This allows me to place my notebooks on a library shelf, and still see what is in each one. On my Dad's side, I have a main notebook. It is labeled simply with the surname BEAN. Then there are notebooks that breakdown the research I have done on each of my great-great-grandparents children, and their descendants. I also use color coded archival tabs for these. Further breaking down the interior of the notebook into the child, and then each of that child's family and descendants. This makes looking up family members quite easy. Of course, I also use an index, and in the index lists each of the subfolders. Protect those documents you worked hard to find, and probably paid good money for! I've been told by the State Historical Society, as well as our local historical and genealogical societies that this is the best method if you are planning to donate your research after death. And of course, backing up your files monthly onto the latest form of digital saving, will always be accepted as well. It is also good to include your family's story. The problem I have with including my family's story, is that it seems to grow in leaps and bounds yearly! I would need to update it constantly. My goal is to wait until I retire, or until I am too weak to work, and spend my remaining years writing that great piece of genealogy! Do you save your hard copies? If not, why not? If you do, how do you save them? I am so very proud of my family Members who have, and are still, serving our country in the military. 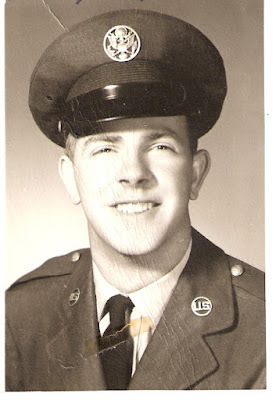 Thank you Uncle Billy for your service. We love ya! On the front road, second from the left, is my Uncle Billy Dreher. He now lives in West Virginia. And fourth from the left, is my Aunt Marion, who has passed. On the back row, from the left, is my pretty Mommy. She was about 5 at this time. 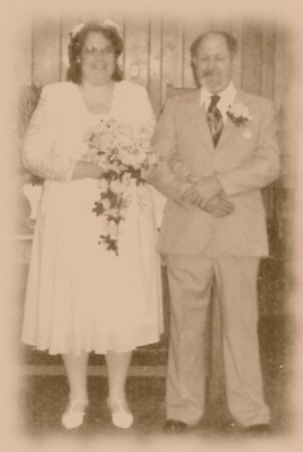 Then my Grandmother and my Grandfather. I love looking at this photograph. There is my Mommy so sweet. And my grandparents so young! 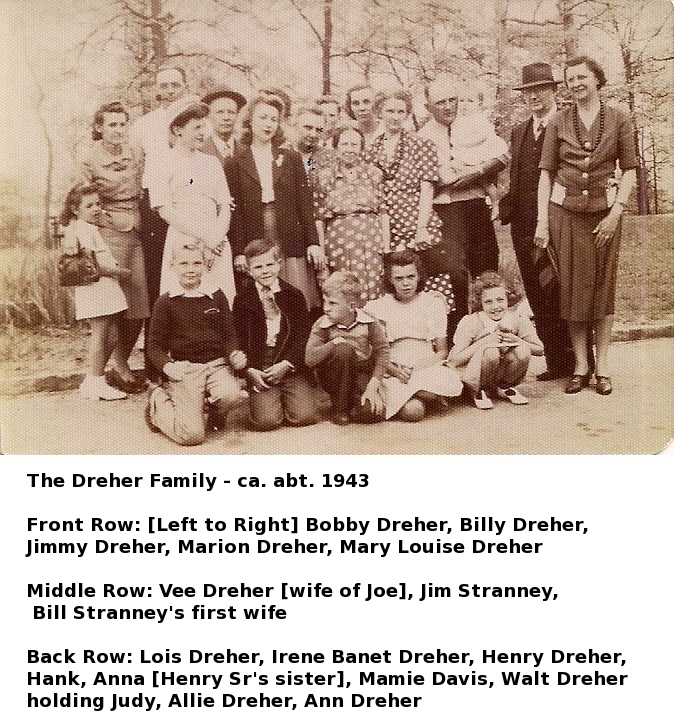 This phot was taken at a Dreher reunion about 1943. The Queen Catherine was later accused of vile sexual indiscretions both before and after marriage to the King. 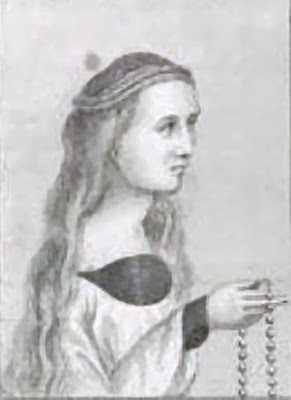 She and members of the Howard household were arrested and placed in the Tower of London. The Dowager Duchess's apartments were searched, and although she declared to have known of the indiscretions prior to the marriage, she repeatedly affirmed that she did not know of those after the marriage to the King. Many of the Howard's were arrested and put in the Tower, including the Dowager's eldest son, William, and a daughter, Anne. When brought to trial their charges were brought down from Treason to misconduct of knowledge of the Queen's Treason. Instead of death, they were sentenced to life imprisonment in the Tower, and all of their possessions, titles, and money's forfeited to the King's coffers. Although named in the charges, the Dowager was not brought to trial as she was 'old and testy', and 'may die out of perversity to defraud the King's Highness of the confiscation of her goods', but like the others she was sentenced to imprisonment and forfeiture of lands and goods. The King thought the Dowager was as guilty of Treason as Queen Catherine and Lody Rochford, both who were sentenced to beheading. However, the Privy Council urged leniency on the part of the King due to the Dowager's advanced age and health. He eventually pardoned her and she was released. Her step-son, the 2nd Duke of Norfolk , was released and forgiven by the King, and was able to keep his possessions and Title. However, he was never fully favored by the King again. The Dowager Duchess died in May of 1545. 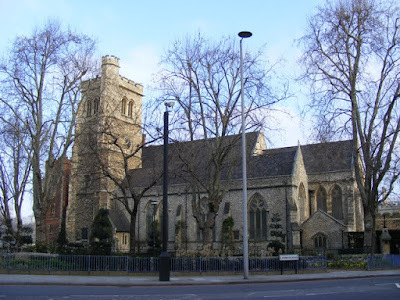 She was first buried at Thetford Abbey, but was later reinterred, at her written request at Lambeth Church in Surrey. Do you recognize this place? You probably know more about it than you think you do. Just from looking at it, one might think it a lovely castle, with a curiosity fence surrounding it so that well meaning visitors don't come too close. This is the Tower of London in England. During the reign of Henry VIII, this particular building, or rather it's grounds, saw many bloody beheadings. And it was only recently that I learned of ancestors who were sent here at old Henry's request! Lord Thomas Howard, my 10th great grand uncle, son of Sir Thomas Howard, 2nd Duke of Norfolk (my 10th great-grandfather), was imprisoned here in early July 1536. He had secretly become engaged to Lady Margaret, the King's sister, and his successor to the throne after his two daughters. The king became enraged over the secret engagement. 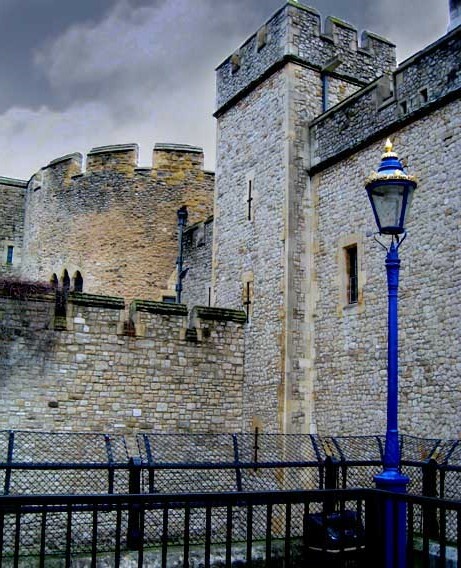 Both Sir Thomas Howard and Lady Margaret Tudor were thrown into the Tower of London. On 18 July 1536 an Act of Attainder accusing Lord Howard of attempting to 'interrupt ympedyte and lett the seid Succession of the Crowne' was passed in both houses of Parliament. The Act sentenced Howard to death, and forbade the marriage of any member of the King's family without his permission. While in the Tower, Lady Margaret came down with a fever. She was moved to Sion Abbey, where she was allowed to recuperate. Howard, however, remained in the Tower. His death sentence was reduced to life imprisonment in the Tower. 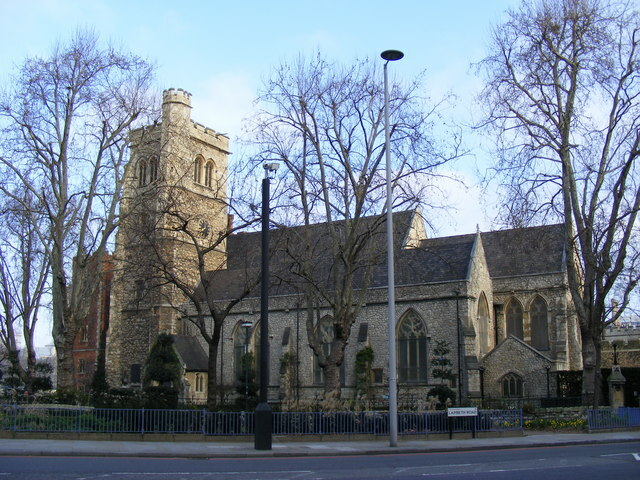 On 31 October 1537, Howard died from a "fatal illness", while still in the Tower. His corpse was turned over to his mother (my 10th great grandmother), the Dowager Duchess of Norfolk. She was given strict instructions to bury him most swiftly and "without pomp". (Funerals for the elite were large lavish affairs, and often cost several thousand pounds back then, equivalent to over a million dollars today.) His mother then buried him immediately at Thetford Abbey. 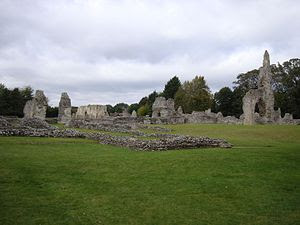 This is all that remains of Thetford Abbey (or Thetford Priory) today. It is here that Sir Thomas Howard lies buried. If there are graves remaining here, there are no stones to mark their place. It's The 1st of the Month - Have You Backed Up Your Files? Today is March 1st. Have you backed up your genealogy files? Let me tell you the story of why I never miss backing up my files at least once a month, and sometimes even more often! Back in 2006 I had a laptop, and I knew I should have been doing backups of all of my files, but I simply didn't. When one morning, I got up, grabbed my tea, and sat down to a laptop I had inadvertently left on all night. I went to turn it on, thinking it was off, and there was a popping sound, the smell of burnt wires, and smoke! My hard drive was MELTED! The lesson learned cost me dearly! Over $800 to find a professional who could pull my files out of the melted drive. Don't be like I was, and regret and cry because you hadn't backed up your files! 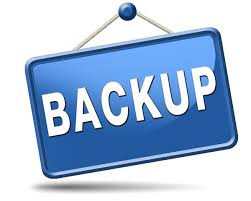 On the first day of every month do a regular backup on your hard drive. I do that, and then I also do a backup on my external hard drive, as well as a third backup on a thumb drive. This includes my genealogy files, as well as all of my precious photographs. It's still early! Get your files backed up before you go to bed tonight!